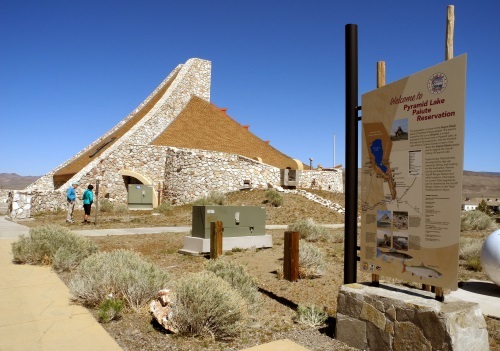 Reno area residents can learn about our Native American neighbors' history and culture with a visit to the Pyramid Lake Paiute Tribe Museum and Visitor Center in nearby Nixon, Nevada. The unique stone structure housing the Museum is the most prominent building in town and houses a number of exhibits, including about prominent Paiute women, tribal members who have served in the armed forces, archaeological artifacts from sites in Nevada, natural history, resource management, and recreation at Pyramid Lake. The Museum also has a gift shop with traditional arts and crafts, along with contemporary arts and gift items. 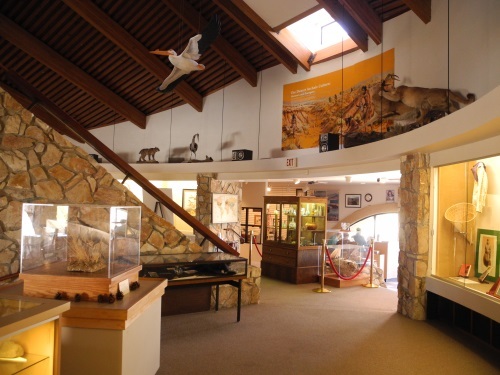 The Pyramid Lake Paiute Tribe Museum and Visitor Center is open Monday through Friday, 10 a.m. to 4:30 p.m. during winter. During summer, it is also open the same hours on Saturdays. The address is 709 State Street, Nixon, NV 89424. The phone number is (775) 574-1088. From Sparks, take the Pyramid Highway (Nevada 445) north for about 20 miles. You will see a sign when the road enters the Pyramid Lake Paiute reservation. At the top of the hill, stop at the turnout for a spectacular view of Pyramid Lake. There is also an informational sign about the Anaho Island National Wildlife Refuge and its breeding colonies of American white pelicans and other migratory birds. At the bottom of the hill, turn right onto Sutcliffe Highway (Nevada 446) and continue around the south end of the lake to Nixon. The Museum is the prominent building on the left as you enter town, just past Pyramid Lake High School. The total trip is about 44 miles. From Reno or Sparks, go east on I80 for about 30 miles to Wadsworth / Pyramid Lake exit 43. Turn left and follow the signs to Pyramid Lake and Nixon. You'll drive north on Nevada 447. As you enter Nixon, turn left onto Sutcliffe Highway (Nevada 446) and drive a short distance to the Museum. You will be able to see it on the right. The total miles for this route are about 50. A loop trip can be made by taking either route to Nixon and returning by the other.